How to make a Restaurant income Statement Template? An easy way to start is to download this Restaurant income Statement Template now! The restaurant income statement is also called as P&L (profit and loss) statement. Downloading word format is possible in a Restaurant income statement. The restaurant income is financial document and that helps all the restaurant owners in order to understand the net profit as well as loss and more importantly the restaurant income statement contributing to improve business. The restaurant income statement PDF format used to analyze the actionable insights and gain valuable due to that download immediately. Now we provide this standardized Blank Personal Financial Statement template with text and formatting to help you finish your document faster. If time or quality is of the essence, this ready-made template can help you to save time and to focus on what really matters! Our Templates have helped many people to reach the next level of their success.Don't try to reinvent the wheel every time you start to work on something new! Instead, download this Restaurant income Statement Template now for your own benefit! 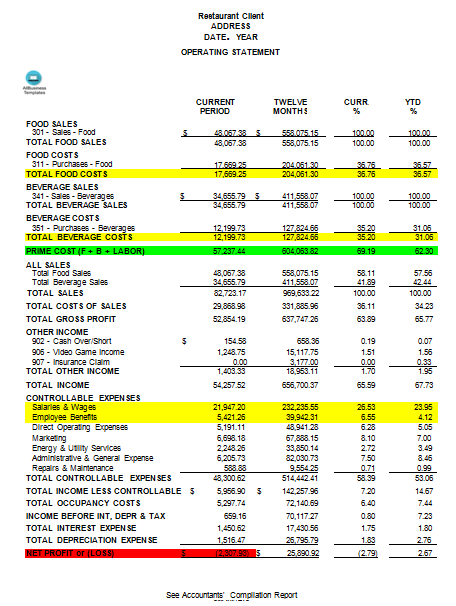 Download this Restaurant income Statement Template now! This template will perfectly suit your needs! And after downloading you can craft and customize every detail of its appearance very quickly.